Please contact Bert's secretariat at the secret-wg office. (Bert at secret-wg dot org) if you have tools that are completely useless and just need to be published. The floating "Read by Bert button." 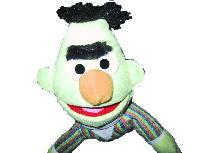 Ever wanted a Bert that just won't go away? This tool puts a Bert on the left side of your web page that scrolls along with the page. Don't forget to edit menus.js to change the image URL for ReadBy-small.jpg to a local URL. Tired of maintaining all the links to your mp3 files... Just run this little script. You should of course respect the DMR folk$ and not make your mp3 files available to those who have not got a copy off the music on original media. Ever needed to calculate something and the damned computer did not have "dc" installed... Well now you can use BSRPDNSC. Cast your operation into a simple query, dig and see the result. True lunacy is that the answer is DNSSEC signed (if requested for). What a reverse polish calculator is, is described on the net, you just google. Essentially you push arguments and operators on a stack, the operators take the number of arguments they need from the stack operate and put the result back on the stack. With BSRPDNSC you use DNS labels in your query to put the operands and arguments in. The most significant label being the bottom of the stack. The queries go to the "rp.secret-wg.org" domain with QTYPE=TXT. So to calculate 2*3+2 you "dig 2.3. *.2.+.rp.secret-wg.org TXT"
The decimal point is somewhat of a problem. Escaping the point using "\." does not work satisfactory due to library problems. Replace the decimal point by a "," and you'll be fine. 1.2 + 2.3 is to be entered as 1,2.2,3.+.rp.secret-wg.org TXT. Stack underflows result in SERVFAIL, stack overflows result in only the last element on the stack to be returned. Let us know if you spot problems. Tool 1 was contributed by Geoff Huston, (function.js was written by Andy Woolley). Tool 2 & 3 come from the secret-wg.org Secretary. Ruben van Staveren came with the idea of a DNS based calculator (Based on the idea of a web based calculator by Geoff Huston i.e. wildcard in the DNS and CGI magic to parse the results). Useless tools are alpha code. No WARRANTIES, No LIABILITY accepted, all other disclaimers in place.